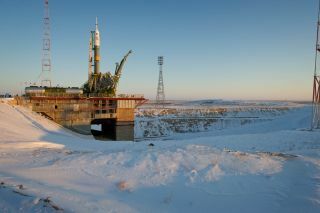 The Soyuz TMA-03M spacecraft stands on the launch pad at the Baikonur Cosmodrome in Kazakhstan. The vehicle is slated to carry three new crewmembers to the International Space Station on Wednesday (Dec. 21). A diverse crew of veteran spacemen is poised to blast off toward the International Space Station on Wednesday (Dec. 21) to double the population of the orbital outpost just in time for Christmas. NASA astronaut Don Pettit, Russian cosmonaut Oleg Kononenko, and Dutch astronaut Andre Kuipers, part of the European Space Agency (ESA) will join three men already living aboard the space station as Expedition 30 flight engineers. The trio will lift off from Baikonur Cosmodrome in Kazakhstan early Wednesday at 8:16 a.m. EST (1316 GMT) aboard a Russian Soyuz TMA-03M spacecraft. They are expected to arrive at the orbiting laboratory on Friday (Dec. 23) at 10:22 a.m. EST (1522 GMT). "We'll celebrate the holidays in great fashion after they get here," Burbank said. NASA photos from the central Asian launch site show the region covered in snow. A NASA spokesperson described the temperatures as "bitterly cold" in a video recorded at the launch pad on Monday (Dec. 19). The temperature was about minus 15 degrees Fahrenheit (minus 26 degrees Celsius). The new arrivals will put the space station at its full crew complement of six and allow the spaceflyers to focus on science research, rather than simply station upkeep. "Each of these experiments somehow makes use of the weightless environment of the space station or they make use of the actual high-vacuum environment outside," Pettit told SPACE.com in a preflight interview. "You're literally in a frontier environment where the answers are not in the back of the book." Pettit, Kuipers, and Kononenko will join Burbank and flight engineers Anton Shkaplerov and Anatoly Ivanishin of Russia. They will spend about five months in space, before returning to Earth in May 2012. Their stay is scheduled to coincide with the first arrival of a commercial cargo spacecraft to deliver supplies to the outpost. Private space company SpaceX's Dragon spacecraft is due to make its first launch to the space station Feb. 7 atop a SpaceX Falcon 9 booster. The craft will make an automated approach to the laboratory, and then space station crewmembers will grab onto it with the station's robotic arm. The Dragon is one of a new fleet of commercial spaceships under development that NASA has been encouraging to pick up the slack in cargo delivery left by the now-retired space shuttles. Kononenko, Pettit and Kuipers are all making return visits to the outpost, as all have flown to the International Space Station on previous missions. "When I went the first time I think the station was half the size it is now," Kuipers said during a press conference earlier this year. "People ask me, 'Why do you have to train so much? You've been there.' Well, it's pretty much different." Indeed, the space station, now complete, is the football field-size product of more than a decade of construction. Now that NASA's space shuttle program is retired, it is the focus of the agency's current human spaceflight efforts.